Learning how to recognize group leadership is an important skill that any stock investor can improve upon with some historical stock research. Buying a stock that's part of a strong group move can give it a tailwind that may propel it to great heights. But how do you recognize group leadership? Group leadership can set up in both bull and bear markets. Despite this challenge, I have one template/model that may help you recognize group leadership. 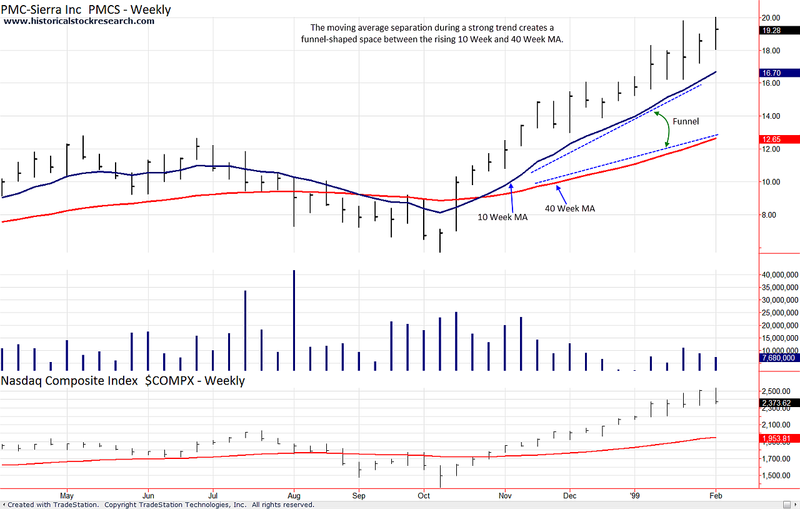 Wait for a strong leg up in the market and identify the groups that are moving back above their major moving averages (10 and 40 Week MA) or coming out of consolidations. Yes, this process can happen during a bear market rally. That's why it's a good idea to stay vigilant when looking for the leading names outperforming the market. The strongest groups will feature stocks that show a definitive separation between their rising 10 and 40 Week MAs that resembles a funnel. Note: A strong uptrend will drag the majority of stocks higher. Focus on the groups with strongest uptrends/outperformance and the best growth prospects. Look for a market consolidation or a more pronounced correction after Event 1. During this time, identify the groups that are holding above their 40 Week Moving Average and building bases. Since a base is a precursor of market leadership, the market consolidation/correction is said to "set the table" because it's helping form the bases that may break out and provide market leadership in the future. Note: While the majority of stocks in the group are basing, you can look for other group members that "refuse to base". These stocks continue to press higher despite the market consolidation/correction. Their strength is important to notice because it gives you a clue that the names basing may resume their uptrends. Start monitoring the group's most mature bases for breakouts. When you find one, note where the other stocks in the group are in their base formation process (early, mid or mature). The presence of mature bases within a group gives you a hint that a collective move higher may be setting up for the group. Stock base breakouts DO NOT have to coincide with new highs in the market. Note: Keep in mind that you may have more than 1 base breakout occurring on the same day/week, which is very bullish for the group. When you see a second or third stock in the group break out, you have more confirmation that a group move may be in the works. Watch to see if the remaining stocks in the group come up the right-hand side of their bases and break out. © 2013-2016 Historicalstockresearch.com All Rights Reserved. Reproduction without permission prohibited.